Blog to End the Occupation: Only 48 Hours Until Country-Wide BDS Day of Action! Only 48 Hours Until Country-Wide BDS Day of Action! This year, what better way to honor International Human Rights Day than to join with others around the country to say NO to investment in Occupation & Apartheid! 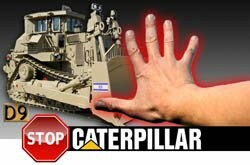 If you haven't already, it's not too late to join this initiative by Jewish Voice for Peace to tell financial company TIAA-CREF to divest from Caterpillar, Motorola, and other companies profiting from Israeli violations of Palestinian rights. Organizers in more than 20 cities around the country are mobilizing to bring their voices to local TIAA-CREF offices in the form of petitions, face-to-face meetings, and demonstrations. If you haven't already, register here to join with others in your area already taking part. You can find more general information about the campaign, a step-by-step guide, and a sample petition here. This Friday, join the chorus of voices telling TIAA-CREF we will not stand for profiting from Occupation & Apartheid!